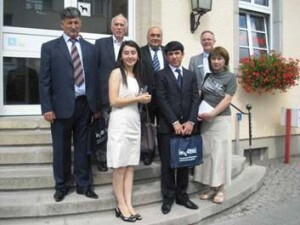 A two week intensive course about the information needs of small and medium-sized enterprises from Tajikistan was held in July 2020 in Berlin-Koepenick, above all under the orientation of Tajikistan’s participation in the world economy. The programme was run by InWEnt gGmbH in Bonn, one of the big consultings working on behalf of German cooperation, and supported logistically and for local programmes in Berlin-Brandenburg by Bildungszentrum (Training Centre) am Mueggelsee, and its content had been designed and delivered by LIBERTAS – European Institute GmbH. InWEnt is the German partner of a consortium which at present is active in this Central Asian country in a bigger trade and SME project in its capital, Dushanbe. Tajikistan has for a long time been the poorest member state of the CIS and has common borders towards China, Afghanistan, Uzbekistan and Kyrgyzstan – in a crisis-fragile region. The more its economic consolidation is of importance, and on this way the country has made some considerable progress during the last years. The Chamber of Commerce and Industry whose delegation has been led by Mr Asanali Karamaliev was represented by five leading persons from the chamber management from Dushanbe and a regional chamber from Khorog. The Chamber is, differently e.g. to those in Germany, France, Italy, Austria etc. not based on compulsory but voluntary membership. At Savings Bank (Sparkasse) Märkisch-Oderland in Strausberg/Brandenburg. Among the subjects here were the start-up of enterprises, business plans and the practice of credits for SMEs as well as in general the access of enterprises to finances, but also tourism was discussed. The participants had discussions e.g. on regional integration, the consequences of the future WTO accession, cooperation questions for enterprises, the work of EU information points, export and import questions, financing of start-ups and enterprises, trade fairs and expositions etc. Their external programme included, among others, visits in the Berlin House of Representatives with talks and meetings with M.Ps and the Speaker, with prefabricated house factories or an agricultural cooperative, but as well as a visit to Slubice/Poland, the training centre of the Frankfurt/Oder Chamber of Crafts, the Savings Bank (Sparkasse) on the Maerkisch Oderland District in Strausberg/Brandenburg, but also the Committee on Trade Fairs & Expositions of the German Economy. Unfortunately the two weeks of the visit were hardly enough to discuss all aspects of SME-related subjects, but so far the visit of the Chamber representatives of this 8 million country under the Pamir montains of Central Asia was an excellent appetizer for a further follow-up, at least. The Tajik economy, where besides Tajik, a Farsi language, Russian is spoken by all economic agents, but also more and more English, registrates the need of a catch-up of business contacts towards the EU. Export products are, among others, textiles, agro-processed goods and artisan craft. Tajikistan needs also foreign direct investment, e.g. for added value to extracted raw materials, and to develop tourism which has increased considerably during the last years. In Slubice/Poland, where Transport Consultant, founder of the East Brandenburg Transport Conferences and Managing Director of a Polish-German cooperation for railway issues (IGOB EEIG), Mr Karl-Heinz Bossan, discussed among others about bonded customs warehouses for international trade in goods, here – at the right – with Mr Asanali Karamaliev, head of the Tajik delegation.